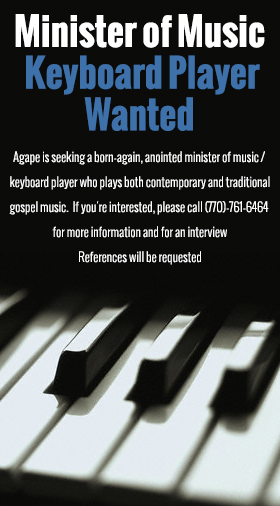 Agape Fellowship Christian Center was founded by Curl Oral Hazell. It held its inaugural service in a conference room at an area hotel on September 4, 2005 in Conyers, Georgia. It purchased its own facility on December 2, 2014. Agape officially became a part of the Bethel Gospel Tabernacle Fellowship International on October 30th, 2011. To continually strive to be a church community that fosters Christian fellowship with people of all races and background. This fellowship is founded upon salvation through the cross of Jesus Christ and obedience in adhering to the uncompromising teaching of Scripture, which is exemplified by genuine love for one another, as Christ commanded us. Agape Fellowship Christian Center not only endeavors to cultivate Christian Fellowship within its local congregation, but also to consolidate efforts with other ministries, both at home and abroad, to evangelize in obedience to Christ’s command to go into all the world, to preach and teach the Gospel, and to baptize in the name of the Father, of the Son, and of the Holy Spirit, thereby inviting the world to enter into the same joy of fellowship in Christ as we enjoy. He is the Creator (Gen 1:1). He begot the Son (John 3:16). This is an eternal act of the Father—God from God. The Son always was, just as the Father always was (John 8:58). The Holy Spirit proceeded from the Father (John 15:26). This is an eternal act of the Father—God proceeding from God. The Holy Spirit always was, just as the Father always was (Gen 1:2). The Lord’s Supper (Matthew 26:26-29): This is an act of obedience to the Lord’s command to commemorate His sacrificial death. The bread represents His broken body while the fruit of the vine represents His shed blood. We are commanded by the Lord to perform this ceremonial act until He returns, at which time He promises to do it anew with us in glory. Agape partakes in Holy Communion on the first Sunday of every month. Water Baptism (Matt 28:19; Rom 6:3-4): This is an act of obedience to the Lord’s command. It is an act of declaration, signifying one’s belief and trust in Christ’s death, burial, and resurrection for salvation. Baptism alone does not save, but a confession to the Lordship of Christ is first required. The Pastor is the leader/shepherd of the flock but not its lord (1 Pet 5:2-3). As the leader, the Pastor is expected by God to lead and to feed the flock (Jer 23:1-4). The Pastor plays a vital role in edifying and equipping the flock for service to the Great Shepherd—the Lord (Ephe 4:11-12). 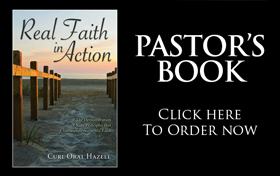 Each member is expected by God to follow the Pastor as his/her spiritual leader in support of the vision for the ministry (1 Pet 5:3) as the Pastor follows Christ (1 Cor 11:1). Each member is also expected to seek God to know his/her gifting and to be good stewards of every gift in the work of the ministry (1Cor 4:2; 1 Cor 12).